Hurricane Irma bore down on southern Florida on Sunday with 130 mile-per-hour (210 kph) winds, flooding Miami streets and knocking out power to more than 1.6 million homes and businesses. 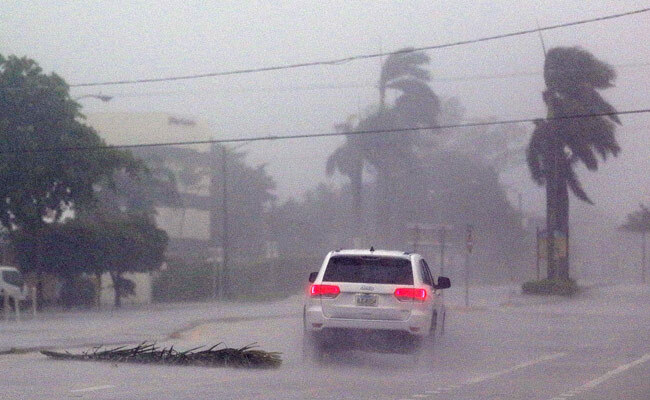 Even before it came ashore, Florida was feeling Irma’s fury with at least one man killed, a woman forced to deliver her own baby and trees and apartment towers swaying in high winds. The storm was one of the most powerful ever seen in the Atlantic and has already killed two dozen people in the Caribbean and pummeled Cuba with 36-foot (11 meter) waves on Sunday. Its core was located about 50 miles (105 km) south of Naples by midday. Some 6.5 million people, about a third of the state’s population, had been ordered to evacuate southern Florida. Officials warned that Irma’s heavy storm surge – seawater driven on land by high winds – could bring floods of up to 15 feet (4.6 m) along the state’s western Gulf Coast. It submerged the highway that connects the isolated Florida Keys archipelago with the mainland and small whitecapped waves could be seen in flooded streets between Miami office towers. Irma is expected to cause billions of dollars in damage to the third-most-populous U.S. state, a major tourism hub with an economy comprising about 5 percent of U.S. gross domestic product. At least 1.6 million Florida homes and businesses had lost power, according to Florida Power & Light and other utilities. The National Hurricane Center forecast that its center eye will move near or over the state’s west coast later on Sunday. The count of people killed by the storm in the Caribbean rose to 24 on Sunday with two new deaths reported on the Dutch portion of Saint Martin. Irma has already claimed at least one life in Florida, after a man’s body was pulled from his pickup truck, which had crashed into a tree in high winds. The storm winds downed a construction crane and shook tall buildings in Miami, which was about 95 miles (153 km) from Irma’s core. Deme Lomas, who owns Miami restaurant Niu Kitchen, said he saw a crane torn apart by winds and dangling from the top of the building. Miami streets were flooded as the water crept up on and around Brickell Avenue, which runs around 550 feet (168 m)from the waterfront through the city’s financial district and newly built high rises. South Florida’s large population of elderly residents posed a severe test for the emergency shelters, many of which were not equipped for people with elaborate medical needs. Irma is now a Category 4 storm, the second-highest designation on the Saffir-Simpson scale. One woman in Miami’s Little Haiti neighborhood delivered her own baby, with medical personnel coaching her on the phone because emergency responders were not able to reach her, the city of Miami said on Twitter. The two are now at the hospital, it said. U.S. President Donald Trump spoke to the governors of Alabama, Georgia, South Carolina and Tennessee on Sunday and issued a disaster declaration for Puerto Rico, which was hit by the storm last week, the White House said.